Rocket's Location in Avengers: Endgame Trailer Revealed? 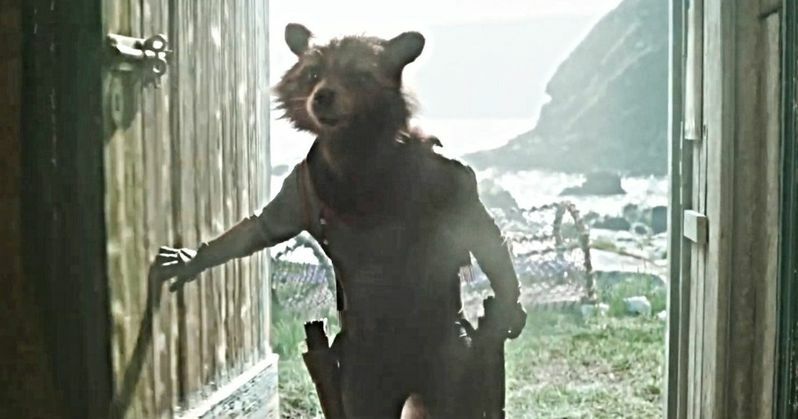 The new Avengers: Endgame trailer provides us with a brief look at Bradley Cooper's Rocket Raccoon opening a door. The location is a mystery, but it appears that some eagle-eyed Marvel Cinematic Universe fans may have found the location, thanks to an old set picture from 2017. In addition to the return of Rocket, the trailer shows off what many believe to be a throwback uniform from the Guardians of the Galaxy comics, which is a pretty cool nod to the source material and the history of the character. When Rocket Raccoon opens the door in the Avengers: Endgame trailer, he appears to be on a bluff with rocks and water behind him. In 2017, filming for the movie was taking place at a mock pub on the southeastern coast of Scotland in St. Abbs, which is a quiet fishing town. As seen in the pictures, the tavern in question is called The Cormorant and Tun. It's not clear what Marvel Studios was using it for, but the area around it sure looks a lot like the background to the Rocket scene in the new trailer. Back when the pictures were leaked online, it was revealed via the local newspaper that Robert Downey Jr., Mark Ruffalo, and Chris Hemsworth were all spotted in the area. The paper went on to say that Avengers: Endgame was shooting in Glasgow, Edinburg, the Highlands, and Berwickshire too. It should also be noted that it was rumored that Scarlett Johansson was spotted in the area too. But what does this pub have to do with the main storyline? Are the Avengers meeting in a pub to celebrate Tony Stark's return to Earth? Probably not. But we could see something having to do with the Infinity War location of Scarlet Witch and Vision at the beginning of the movie. Those two characters are seen walking around Edinburg in the old town section before they are attacked by Thanos' Black Order. Maybe the surviving Avengers have gone back in time to retrieve the duo before the Black Order comes to town? That's all pure speculation, but we know that there will be some time trickery utilized in Avengers: Endgame. While we know where Rocket is on a map of the world, we don't know why he is there and why the rest of the Avengers are there. However, it would be pretty wild to see a walking, talking raccoon with a gun walk into a pub, which means that we could see some comedy in this particular scene. We'll just have to wait and see what the Russo Brothers decided to do with this location and how it fits into the story as a whole. While we wait for Avengers: Endgame to hit theaters, you can check out the set pictures from 2017 below, thanks to the MCU News and Tweets Twitter account.